Our honey-colored morning is airbrushed with dust as we scuff our way toward a mid-day meal. The road we’re following, just two ruts in the sand, has a center grown up in grass. It’s as tall as the undercarriage of a passing vehicle, but a lot shorter than the undercarriage of passing elephants. Paved roads don’t exist in this part of the Okavango Delta; spring floods would only wash them away. 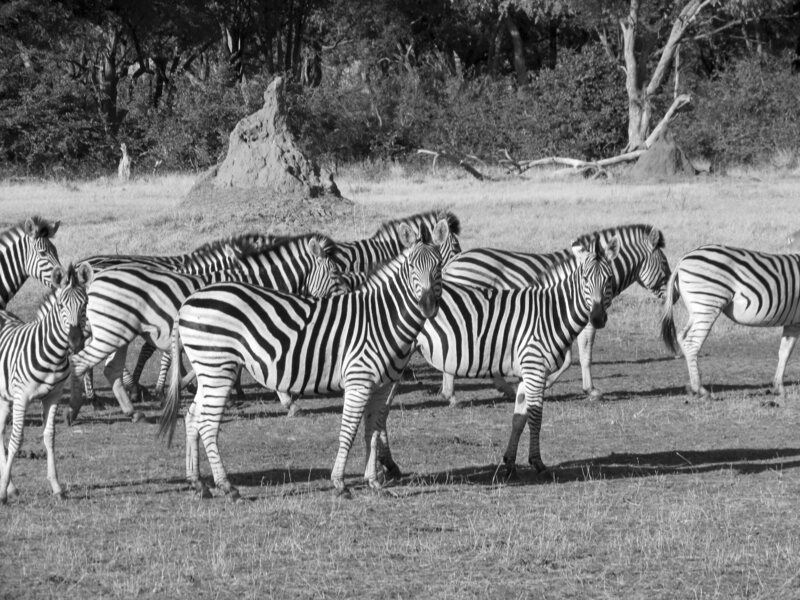 Off in the distance zebras nod as they plod past a line of trees. Yes, this is the right way; Yes, this is the right way. They are nature’s bar codes, no two alike. In his book, Origin of Species, Darwin speculated on whether a zebra was a white horse with black stripes or a black horse with white stripes. He compiled examples of the occasional striping on all horses, arguing that a trait from a distant common ancestor, white on black, is brought to full fruition in the zebra. His examples revealed that some zebras are born with white dots and blotches, incomplete stripes on a black background, Morse code instead of bar code, natural proof that a zebra is a black horse with white stripes. The white is lack of pigmentation. So – here’s the question that pops into my mind as I watch the zebras: do zebra foals imprint on the black stripes of their mothers or on the white stripes? The accepted belief puts money on the black pattern. But isn’t that the human response, the bar code response? Not one of us knows what a zebra knows.